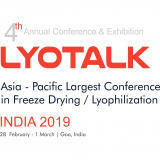 "Asia Pacific largest conference in Freeze Drying Lyophilization"
The 2 day conference attracts 150+professionals & experts from pharma, biotech and Academia from Asia Pacific and rest of the world for 2 days of learning of latest technology and networking, discovering new opportunities & partnerships. The event covers a wide spectrum from formulation, Development, Production, manufacturing and regulatory affairs topics such formulation strategies, Scale-up, cycle development & optimization, Regulatory compliance, Quality by Design (QbD) , PAT process design, Ice Nucleation, Case studies & troubleshooting, New developments in freeze drying, Process development for generics, proteins, biologics and vaccines. DoubleTree by Hilton Hotel Goa ..